Thailand's King Bhumibol Adulyadej is no more. He was not an ordinary king. He was a fine inventor and innovator and many of his inventions were devoted to development. The King owned over 20 patents and 19 trademarks, most of which are tools and techniques for rural development projects. In order to counter drought in his country, which was crippling farmers, he spent years researching cloud-seeing techniques and used his own money to launch the Royal Rainmaking Project. His 'Super Sandwich' technique of cloud seeding not only got him a European patent and scores of international awards but earned him the epithet of "Father of Royal Rain-Making" from his subjects who loved him dearly. Last year, Australia's Queensland requested Thailand to share this rain-making technique to counter its drought and a collaboration was started. Another of his popular inventions was the Chaipattana aerator. This was developed as a low-cost solution to help address water pollution in rivers, canals, swamps and marshes. The Chaipattana aerator is used in many locations including Bangkok's Makasan lagoon, initiated by His Majesty the King himself, and in Ayutthaya's Bangpa-in Palace, implemented with cooperation from the German business community. Today, the aerators (which won many innovation awards) are widely used to treat water in both Bangkok and rural areas. Other royal inventions include water purification devices, a liquid-propelled engine for small boats, as well as techniques for conversion of palm oil into palm diesel as an alternative source of energy, and techniques to revitalise acidic soil. 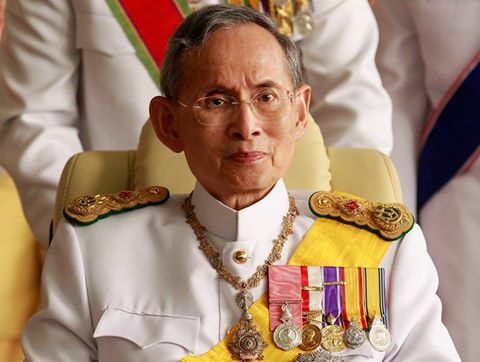 I mourn with the Thais at the passing of a great monarch. He had his faults but he was loved. Not sure if monarchy will survive after this death because his heir is not known all that much to the people. I believe the Indic institution of monarchy in its ideal form where the royals and their subjects understand their dharma, has always been an effective way of maintaining peace, harmony, cultural traditions and balance between environment and commerce. Apart from the political struggle that will follow, I also worry about the Christian missionaries who are waiting on the sidelines for the death of this king whose remarkable influence prevented them from making significant inroads into Thailand. I remember reading several articles by pastors who were wondering how to break the devotion for the King as well as Buddha and get the people into the Christian fold. Thailand has been one of the countries which has stumped evangelicals for a long time. Laa-gàwn (goodbye) dear King, may your love protect and preserve the country and take it to great heights.